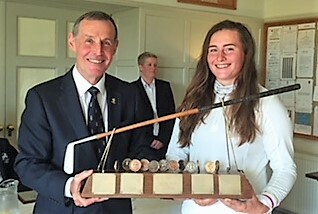 Lily May Humphreys receives the Helen Holm trophy from the captain of Royal Troon Golf Club, Alasdair Cameron. Picture by Elaine Farquharson-Black. 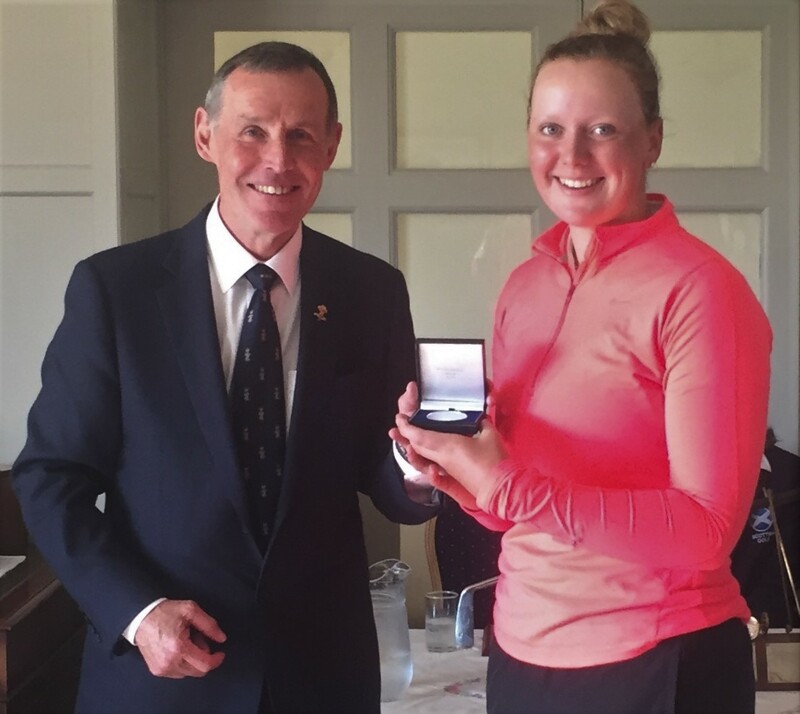 Essex girl Lily May Humphreys (Stoke by Nayland Golf Club) dashed home hopes of a long-delayed victory at the Helen Holm Scottish Women’s Open Championship at Royal Troon, securing another notable title at Royal Troon. With joint overnight leader Shannon McWilliam (Aboyne), St Regulus’ Chloe Goadby and first-round leader Hannah McCook (Grantown on Spey) all in the hunt going into the final 18 holes, there were genuine hopes of a first Scottish winner in the event since Heather Stirling 16 years ago. 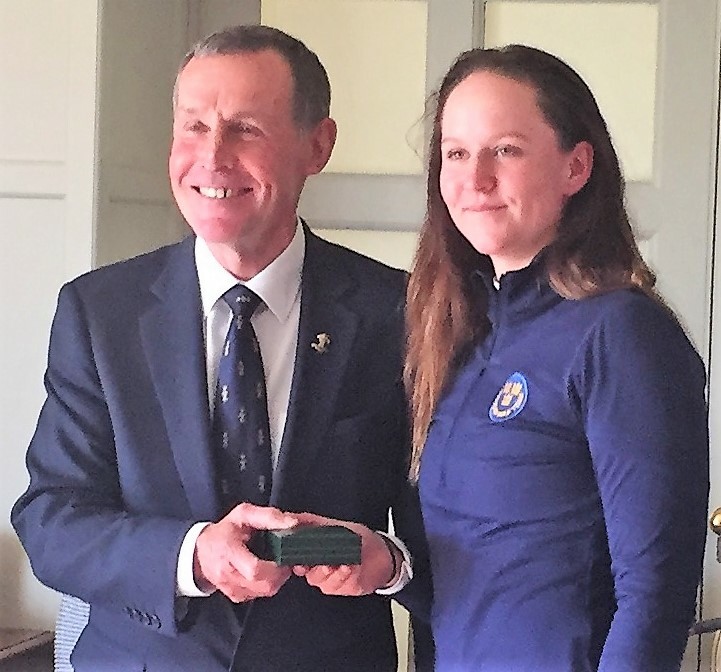 But the wait goes on as reigning English women’s amateur champion Humphreys, who had her 16th birthday only last month, claimed another prestigious prize with a one-stroke win ahead of the strong-finishing Goadby, last week's winner of the British student women's title at Woodhall Spa. Humphreys now looks a certainty to be named in the Great Britain and Ireland Curtis Cup team, announced at noon on Thursday, while the likes of McWilliam and Goadby will hope they have done enough to impress on-looking captain Elaine Farquharson-Black. Humphreys finished on nine under par 207 after a superb closing four-under 68 in the breezy conditions, helped by a hat-trick birdies from the seventh, with two further birdies at 12 and 13 ultimately proving decisive. It’s the Essex teenager's sixth title in the last 10 months and it marks a welcome return to top form for the 16-year-old, who is also the English women’s amateur champion. Goadby, in the group in front, just couldn’t reel Humphreys in, despite birdieing the third, fourth, seventh, 12th, 16th and 18th in a final-round 68. A bogey at the par-3 17th was to prove costly in the final analysis. Defending champion Sweden's Linn Grant, whose grandfather, James Grant won the Scottish boys championship in 1958, finished third on seven under par 209 – with the Swedes taking the team title by a shot over Scotland – with McWilliam finishing on five under. 207 L M Humphreys (Stoke by Nayland) 71 68 68. 211 S McWilliam (Aboyne) 69 69 73. 212 I Wardle (Prestbury) 71 69 72. 215 H McCook (Grantown on Spey) 67 75 73, L Malchirand (Fra) 71 70 74. 217 G Batty (West Linton) 75 70 72. 219 G Dumez (Fra) 74 69 76. 224 C Leathem (Wilmslow) 73 78 73, S Lamb (Clitheroe) 75 74 75, A Fuller (Roehampton) 76 73 75, S Burke (Ballinrobe) 75 72 77. 228 C Gainer (Castle Royle) 77 74 77, K Drocarova (Slovakia) 77 72 79, C Martin (Fra) 72 76 80, M Garland (Selby) 76 72 80. 229 H Darling (Broomieknowe) 76 76 77, L McClymont (Milngavie) 76 76 77, A Sundberg (Sweden) 76 75 78. 230 G Lewis (Southerndown) 76 79 75, L Lau (Fra) 78 75 77, D Harry (The Vale Resort) 79 72 79, T Mactaggart (Minto) 77 74 79, E Rhodes (Burnham and Berrow) 80 71 79, T Kirby (Harleyford) 76 74 80, A Dawson (Peel) 73 75 82, L Walsh (Castlewarden) 78 69 83. 240 A Pitts (Beadlow Manor) 81 74 85, L Fraser (Kingsknowe) 79 76 85, A Collis (Letchsworth) 77 74 89. Retired: L Bailey (Kirby Muxloe) 75 74 ret, H MacGarvie (Troon Ladies) 76 ret. 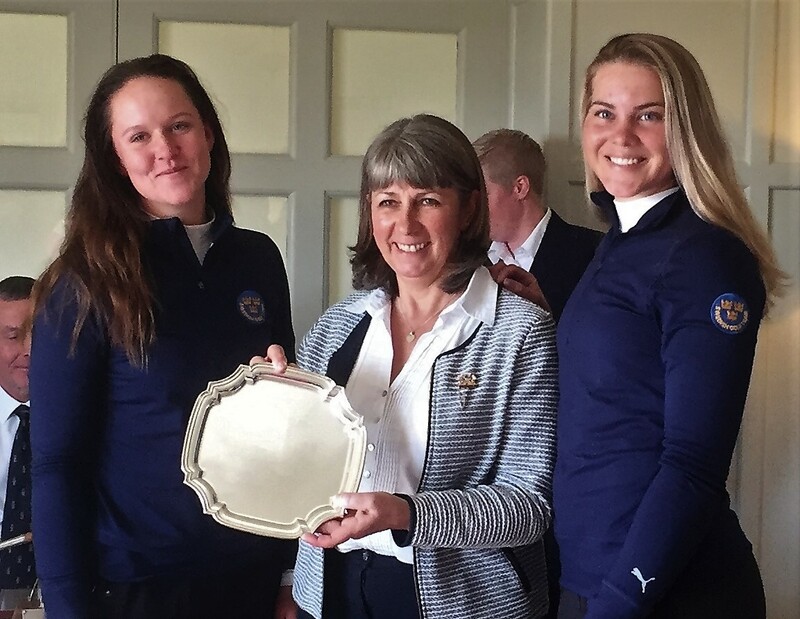 The winning Swedish pair, Linn Grant on the left and Amanda Linner (right), with their captain who holds the Team Salver. Picture by Elaine Farquharson-Black.